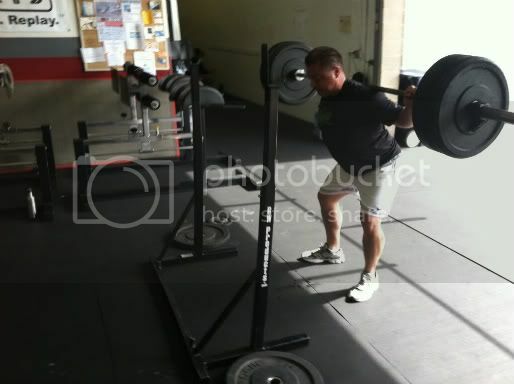 There are a lot of things that go into getting set and starting a lift, in this case the low-bar back squat. Hands over the bar and elbows up, cinch the bar in place over the scapulae. A big held breath, open chest and a tight stomach bear the load off the rack and support the spine. After you're set, the lift must be initiated correctly in order for it to go well. Johnny demonstrates that beautifully here, from his toe position to his chin. Knees are out and back, chest is up, bar is cinched in, slight inclination forward with hip flexion, weight is back. Initiating the movement correctly, Johnny puts himself in a better position to complete the lift efficiently and safely. Kelly and Sarah in sync, Happy Birthday Kelly! October 22nd and the SC Affiliate Challenge are right around the corner! There is a meeting on Monday, October 17th @ 7pm at CF West for ALL volunteers and team captains. Please try to make this meeting as they will be going over movement standards and any other questions we all might have. Contact Annie with any questions.